From the time it was established in 1985, Talent Bank Communicatiions has worked behind the scenes to promote its clients while doing little to promote its own services. With the expansion of editing services into a publishing division, this is changing. 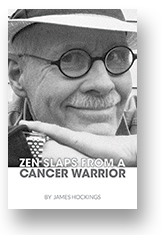 With the September 2017 launch of the memoir Zen Slaps from a Cancer Warrior, by James Hockings, Talent Bank Communications has become a public publishing imprint. Talent Bank assisted several 'desk top' publishing projects prior to the digital revolution led to eBooks, internet marketing and print-on-demand services. The company will continue to provide editorial and other services to traditional publishing projects. However, the new imprint will concentrate on providing the market with new and re-issued titles through the production, distribution and marketing tools now available. It's proving to be a fascinating ride.